Boost awareness of a new product by 30 percent? Generate $60K in additional sales for an existing product? Drive 250K people to a website, or 2,500 to a retail store? Increase the size of your mailing list by 25 percent? Laying out goals in advance informs how you connect campaign elements, from influencers to content to metrics. Be specific. Use numbers. Aim high. Influence is less about reach, more about relevance. I can’t emphasize this enough. We know from experience just how easy it is to fall under the spell of an influencer with a massive audience, especially if that influencer fits your target demographic. Many a brand has marched zombie-like into such an influencer’s open arms. And who can blame them, it’s the traditional metric marketers grew up with in an offline world, and old habits die hard. Don’t let reach alone pull you in. Instead, set your starry eyes on influencers with relevant audiences—audiences that match the profile of your target consumers. Case in point: After its first few influencer campaigns targeting women who drink coffee, WhiteWave Foods discovered that its most effective influencer reached a broad base of coffee drinkers—but didn’t drink coffee herself! Here are a few other points to ponder with your team as you create an influencer persona. What businesses complementary to yours are your target consumers interested in? And who influences for those business? What topics or keywords might your target consumers use to search for content? Which influencers speak on those topics or use those keywords? What factors would knock an influencer out of the running? Past work with a competitor? Work in a space that doesn’t mesh with your brand’s values? Different channels reach different audiences and your approach should reflect that. Although you won’t find many male Millennials milling around on Pinterest, you will find them engaging on YouTube. When thinking about what type of campaign to run, and what kind of content you want influencers to create, start with your objectives and work your way through to content. Are you looking to build campaigns that are clever, supportive, educational, story oriented, long-form content, Twitter parties, Instagram takeovers, YouTube videos, photo galleries, blogger giveaways, the lists go on. 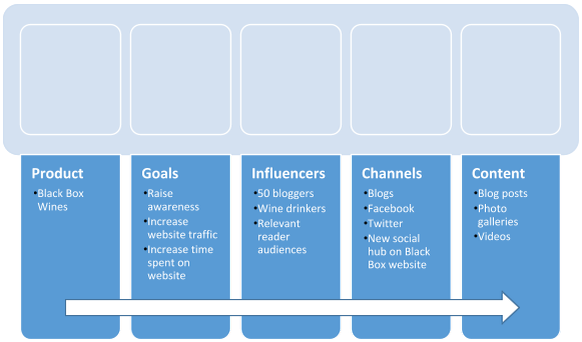 The following illustration outlines how Black Box Wines worked from goals to influencers to channels to content. Their idea: To have bloggers share their experiences of trying Black Box Wine for the first time. Black Box would then post the new influencer-created content on a dedicated social hub on its site. We’ll share the results of the Black Box campaign later, when we talk about measuring campaign results. For now, let’s jump back in to YOUR first campaign. With your plan in place, it’s time to find and vet influencers. As the social landscape blossomed, early adopter brand and agency marketers enjoyed the success of influencer marketing programs. Today, influencer technology has matured into Influencer Marketing Automation with proven best practices that improve your ability to work efficiently and scale your efforts. Technology also means that your options are no longer limited to hiring an expert or contracting with an agency. IMA software comes with best practices baked right in, guiding you through every step of the process: Finding influencers, working with them, managing campaigns, and measuring and communicating results. Let’s start at the beginning, with finding influencers for your first influencer marketing campaign. As recently as 2014, developing influencer programs required a lot of manual labor. You had to scrape the web to find the right people, send cold emails, wait for a response, and negotiate individually. It was a one to one process. Things are much easier now, thanks to the IMA platform and its opt-in influencer marketplace. Your efforts are now one to many. So how exactly does an automated influencer marketplace work? Influencers who want to work with brands register in the platform. They complete their profiles, select their relevant categories, enter their rates, and link their social media accounts. Marketers are able to search for influencers through a variety of criteria and narrow the results by including additional filters: category, social channel, reach, audience demographics, and dozens of other variables. Suppose, for example, that you want to run a campaign targeting women interested in the online fitness space. You search for the keywords “online” and “fitness.” Your idea is that influencers will create videos of themselves using your brand’s product, so you set your sights on YouTube influencers with audiences in excess of 25,000. 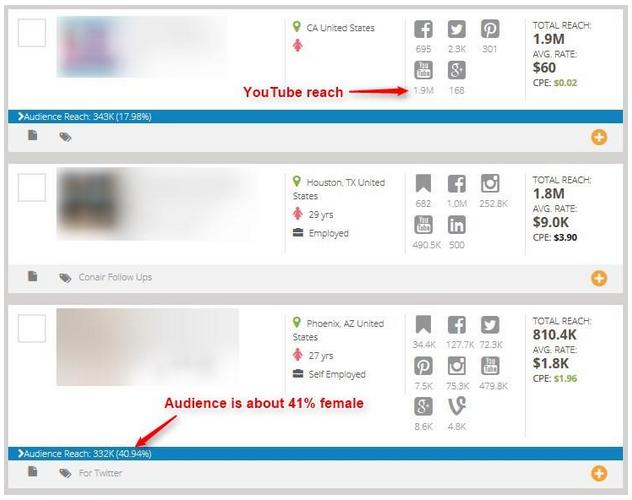 And because you’re targeting females, you apply an audience filter to see what percentage of each influencer’s audience is female. The results that follow show three of several hundred influencers who fit the criteria. Your job is to narrow the results to a list of the strongest contenders, and then to vet those possibilities further. When you find influencers who map to your persona and match your audience criteria, the next step is to vet them—an easy task when you’re using an influencer platform. As an example, let’s look at Simonna, a singer and international celebrity who influences in the music, beauty, and craft categories. Assuming she fits our influencer profile and targets the audience we want to reach, we can click her name to view her profile and media kit, which together provide details such as location, age, whether she has pets, her educational level, accolades she has received, blogs where she has guest posted, the composition of her audience, and more. If, after a review of her profile and media kit, Simonna still seems to be a good fit for our campaign, we can jump right from the platform into each of her social accounts to review the quality of her posts, see how and how much she engages with her audience, and whether she might be influencing for other brands. Repeat this process until you arrive at a list of potential influencers, people you want to invite to partner with you on your influencer marketing campaign. You might think that getting influencers to join your campaign is easy, especially if you found them through an influencer marketplace that they opted in to. That is not always going to be the case. Influencers are busy. The good ones are true professionals. They’re also in demand. They value relationships over one-time “pay for play” gigs. Above all, they value your consideration and respect. Just as you market to consumers, you must also market to influencers, but in different ways. 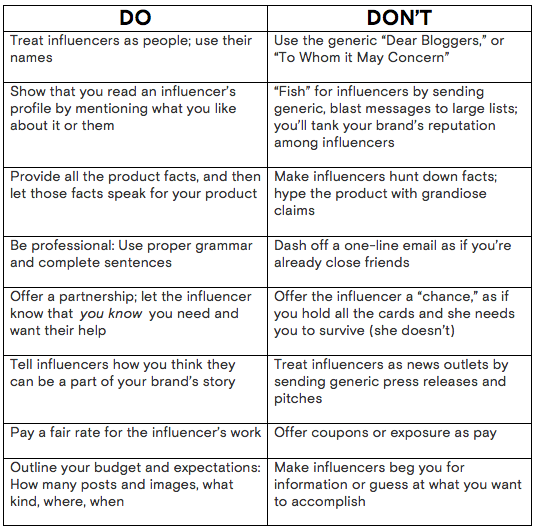 The following collection of Do’s and Don’ts comes straight from the mouths of influencers, both those we’ve worked with, and those who’ve freely shared their thoughts online about the business of influencing. Attend to the Do’s, avoid the Don’ts, and you’ll be well on your way to building successful influencer relationships. The following best-practices will help you manage those campaign elements efficiently and effectively. Ask influencers to respond to your invitation within 48 hours. Otherwise, an influencer may “find” your invite later, after a campaign is over or after you’ve filled their spot with another influencer. If an influencer you’d really like to work with fails to respond, send another message expressing strong interest. But then move on if they don’t reply. If an influencer turns down an offer because your proposed rate is below their posted rate, consider asking the influencer for their minimum rate, and then raising your offer assuming it is within your budget. Or, offer non-cash compensation options, such as free product or covering their hard costs. Edit lightly, if at all. Influencer content works because it’s authentic. That’s why (unless you’re dealing with a regulated industry) we encourage you to embrace the authenticity of influencer marketing by not requiring drafts. This organic approach works if you carefully vet influencers and provide detailed instructions and plenty of creative direction. Today, more than half of the brands using our TapFusion platform do not require drafts. Ask for outlines of vlog content before production. Whether you’re new to vlogging or a seasoned pro, ask influencers to provide at least an outline of the video they plan to create so you can review it beforehand. Also firmly state in your requirements that the influencer is NOT to post a vlog before you issue approval. Adding a sentence like “Failure to do so could result in legal action” will prevent most vlog issues. Request proof of content distribution. If you’re not using a platform like TapFusion, instruct influencers to email you links to their published posts and social shares so you can verify that the content was posted. You probably won’t be surprised to learn that TapFusion takes care of that work for you by verifying posted content automatically through tracking URLs. If an influencer fails to post on a scheduled date, don’t panic. In our experience, most instances of past-due content happen because “something came up that day,” or because an influencer forgot to notify you that they posted. When in doubt, check with the influencer. If you get no response after two or three attempts, send a final “good bye” message and move on. The campaign is now over. Your influencer content is circulating among consumers, being shared, commented on, tweeted, retweeted, pinned, and repinned. How do you know if your campaign is a success? Performance is yet another area where technology serves as a best practice, making measurement and analysis as easy as viewing reports, and optimization as easy as figuring out which influencers, influencer content, and channels performed best among your target audiences. 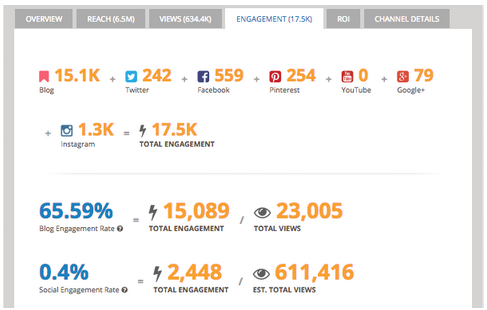 The example that follows shows engagement results from a real campaign. Software also gives you similar windows into reach, views, ROI, and channel performance for one or more influencer campaigns across one or more programs, lines, or brands. Speaking of results, remember the Black Box campaign we talked about earlier? As an approach, influencer marketing is flourishing; the results are proven. Influencer content, by its very nature, gets through the ad blockers. It eliminates the ad-spend waste created by bots. It gets pulled. It gets shared. It drives action. Whether your goal is to create demand, boost awareness, drive traffic, generate leads, or increase sales, influencer marketing works. And now that best practices have emerged, and technology makes the work simple and efficient, influencer marketing deserves a place in your mix. Learn more about getting started with influencer marketing in Unleash the Power of Influencer Content: 8 Things Influencers Can Do for Your Brand. In this free eBook, presented by TapInfluence and Jay Baer, head of Convince and Convert and the author of Youtility, discover how you can work with influencers to expand your reach, drive more action from targeted groups of consumers, meet (and beat) your engagement goals, and much more.